The women in this photo are fellow nurses who are interested in holistic nursing and meet monthly to study various healing modalities and to share experiences. 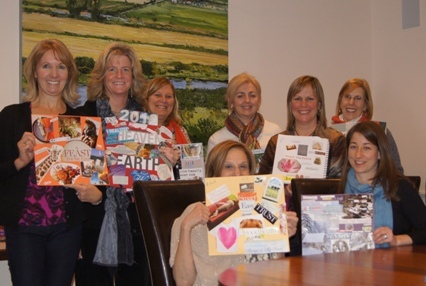 At last month’s meeting, we harnessed the power of our mind to promote positive change in our life by creating “vision boards.” Some of us focused on healthy behaviors while others set intentions around relationships, career and spirituality. In clinical settings, we can use brief interventions which combine relaxation and imagery to promote healing and improve patient experiences. Even just a few minutes of relaxing breathing and visualization before breastfeeding, walking for the first time after surgery, or learning to self-administer insulin can lessen a patient’s level of pain and anxiety and improve success. When we are in a state of relaxation and activate our imagination, our body responds to the sensory input as if it were actually happening. I hope you’ll continue to explore the amazing power of your mind to manifest positive change and to bring mind-body techniques into your nursing practice. How often have you said any of the following to a patient? Our bodies do not discern between what is real and what is imagined in the mind. Using PET scans, researchers have found that the optic cortex, the area of your brain that helps you see, is activated in the same way when you imagine a beautiful sunset or actually watch one. Vivid images send messages to the emotional center of your brain which then passes messages to your immune, endocrine and nervous systems. Guided imagery has been found to accelerate weight loss, lessen side effects of cancer therapies, reduce blood loss during surgery, lessen pain, decrease frequency of migraines, and lower blood pressure, blood glucose and cholesterol levels. 1. Lie or sit with your eyes gently closed. 2. Take 3 slow, deep breaths. Imagine breathing in calmness and breathing away any stress and worry. 3. Allow your breath now to fall into its own easy, comfortable rhythm. 4. Imagine a relaxing place, either one that brought you comfort in the past or one that you create in your mind. Use your imagination to feel yourself in this wonderfully, relaxing place. Notice what you see, hear, feel, and smell. Feeling more relaxed with each breath, enjoy the experience you’ve created in your mind. 5. Hold onto feelings of peacefulness as you bring your focus back. Turn your resolutions for 2012 into a visual expression of your goals and aspirations. Vision boards help you to gain clarity and focus on the positive change you want to manifest. For more information on how to make a vision board, please download our instruction guide. Check out our nurses4wellness community blog for more photos from the holistic nurses’ meeting. Check out our one-hour CE webinars.